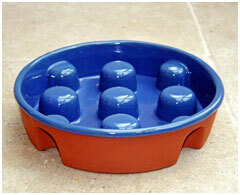 "The Original Greedy Dog Bowl"
That stops dogs bolting food. Aids digestion. Reduces the risk of gastric disorders. THE GOBBLENOT IS THE ORIGINAL Patented Greedy Dog Bowl, designed by myself in 2003, after acquiring a Labrador puppy, or in my case a solar powered hoover, who could devour her food in the blink of an eye, and then make it all reappear seconds later! She was like a possessed piglet; I dreaded feed time and even more so clearing up what she had not! After exhausting all other methods to no avail, I decided to design something myself, so armed with an egg box and cardboard box I set to work, much to the amusement of my family, who all thought I had finally lost the plot ! Then with the help of a ceramic teacher, the Gobblenot was created, and proudly presented to my disguised pig! With food in of course, and to my surprise and great relief it not only worked it was brilliant!! SO BRILLIANT that numerous companies have now tried to copy the Gobblenot, BUT if only they had studied a dog’s way of eating, and given thought to how different breeds have different shaped faces and muzzles, they may have got it right. So many times I am told I bought the ------ bowl, and my dog can’t get its nose in the bowl, my dog can’t breathe as its too deep, my dog broke out in acne ( usually due to bacteria harbouring in a plastic bowl ) my dog was really ill through a reaction from the toxic chemicals in the plastic -------- bowl (READ, dangers of plastic dog bowls) the bowl did not work, he ran off into the garden and chewed it up, The list goes on, but if you buy CHEAP PLASTIC IMMITATIONS, I’m afraid you get what you pay for ! Buy cheap, pay twice. THE GOBBLENOT WAS THE WORLDS FIRST greedy dog bowl. 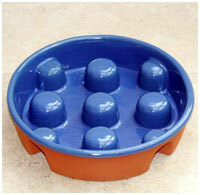 Its unique patented design that creates 4 pockets with open channels within the knobbles, allows food to slide around the knobbles and through the maze as the dog feeds, and by adding a small amount of water to the bowl, this increases the movement of food, DOGS LOVE IT! It is like a game of chase with food with more food around the corner, it stimulates thought whilst feeding, unlike the cheap copies where the dog has to fight for its food due to limited access etc, making them agitated about getting their food, leading to further intake of air, this is their best time of day after all, it should not be stressful!! THE GOBBLENOT not only slows them down immensely, ITS FUN! And the raised knobbles that are the correct height for all dogs (even flat faced dogs i.e. boxers, bulldogs, etc) stops them from grabbing and bolting their food, and literally ELIMINATES THE SUCKING UP OF FOOD! All of which, leads to great gulps of air and food being ingested, leading to sickness, choking, wind, poor digestion, loose stools, and more serious life threatening conditions, such as bloat/gastric torsion. IF YOU ARE AT YOUR WITS END! Thinking you have acquired the greediest dog on earth! Think again. After building our Dog Care establishment, I soon realised my dog was not unique in her vacuuming performance, and the Gobblenot is successfully used on various breeds, large and small, and is a godsend for the two dog family, with one piglet who gobbles theirs then steals the others, it slows them down so much, the other dog has time to finish their food in peace! So if you genuinely want to help your dog to a SAFER way of eating the Gobblenot is the only bowl your dog needs, for encouraging a HEALTHIER and smoother digestion, and a very contented dog. Britain’s best selling dog magazine. Wishing you and your 4-legged friends well.